What came after by Sam Winston is an intriguing scifi novel. It describes a near-future dystopia where a handful of large corporations have taken over the USA. After being a puppet to powerful interests, the government has finally been abolished. In some sense, it is the anti-libertarian novel: what if we let the free market prevail? Eventually, some large corporations may become so powerful that they can use force to prevent competition. Though overall credible, I found the absence of any state a bit unbelievable because I view corporations and states as mutually supporting concepts: large corporations may try to control the state, but they rarely try to abolish it. The hero is out to save his daughter, at first, and then he becomes part of a larger fight. The writing is beautiful. Short sentences. Powerful text. An emotional roller-coaster. The novel would make a great movie. Meanwhile, the e-book is cheap ($3.99). I expect the author to write a follow-up. Unless you live under a rock, you have heard of the Hunger Games trilogy by Suzanne Collins. They recently made a decent movie out of the first book. Like in What came after, the books describe a near-future dystopia where war and oppression have reduced humanity to few towns supporting a relatively wealthy capital. What I found interesting in these novels, is how the main character (Katniss) is an anarchist. That is, she cares for those she love (her tribe), but she is rather immune to big ideas and propaganda. This becomes clearer as the story progresses, and many people have hated the ending for this reason. The trilogy is reasonably priced: you can get all of it for under $20. In the Trilisk Ruins, Michael McCloskey describes a far future universe where human beings have encountered alien ruins on diverse planets. These ruins have obvious commercial values: alien artifacts are immensely valuable. Meanwhile, the government has restricted access to these ruins to its own military. The main character is a xenoarchaeologist who is frustrated by the lack of access to these new findings. She decides to embark with a bunch of pirates/mercenaries who hope to visit new alien ruins before the military can get their hands on them. The novel touches on a common theme in scifi: it is unwise to put your military in charge of first contact with aliens. You can get the e-book for $2.99. 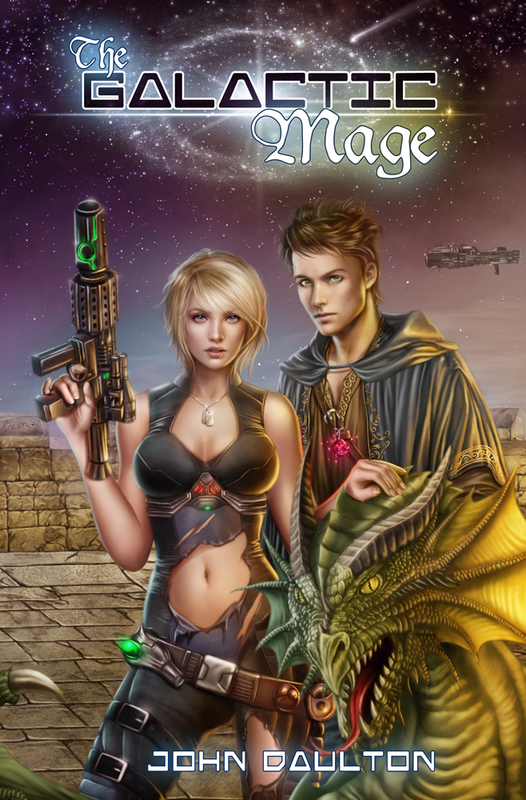 The Galactic Mage by John Daulton is a twisted, but fun story. We have human beings from Earth who were in contact with another human civilization across the galaxy. This civilization was apparently wiped out after it sent a warning. A fleet of ships from Earth is assembled to go investigate. Meanwhile, on a remote planet, a bona fide mage has decided to go explore space. He does so by teleporting himself (and his tower) in space. At first, the premise seems unbelievable, and it is, but it is fascinating to see how a mage might explore space. Without any scientific background, he is faced with several challenges such as unimaginable distances. Unfortunately, the novel never quite feels complete: many issues are left unresolved. Nevertheless, it is an entertaining book well suited for teenagers or people looking for a fun little book. You can grab it for $2.99. Finally, the Empire of the Gods by David Stag is a well written space adventure. It describes a universe where most people live in misery under an oppressive and all-knowing government. The leaders derive their power from mysterious rods that seem to give them the powers of gods. I found it very entertaining even though there are obvious flaws. For example, as in the Galactic Mage, we are supposed to believe that the universe is populated by human beings. Thus, as scifi, this is a so-so book, but thankfully, the novel works well as a fantasy. The writing is solid. The e-book is only $0.99. Disclosure: I got Empire of the Gods for free from the author. Could you also post reading recommendations for those of us who more mathematically inclined?